The first book in Parish Orphans of Devon series by Mimi Matthews, The Matrimonial Advertisement is a Victorian romance in all its glory. Justin Thornhill has known only the language of vengeance throughout his life. Since he served as a captain during the uprising in India, he has been more in touch with violence than romance. He has become a gruff and grim man who has neither time nor interest, mostly interest, to woo a woman. However, his well wishers suggest that he requires a woman in his life. Since the time he owned Greyfriar's Abbey, his reputation with the villagers has not been something to boast about. Moreover, his household seems to work as a repellent of servants. The only logical solution to these problems appears to be the presence of a woman in the abbey. Considering the fact that he is not willing to put any effort in romance, his steward and his lawyer, who also happens to be his good friend, decide to place a matrimonial advertisement in the newspapers. This marriage, to Justin, is only a business deal and there has to be no scope for romance on any level; however, when Helena Reynolds responds to the ad and makes an appearance for the interview, he knows she is too good to be with him. Helena, on the other hand, knows that marrying Justin is her only chance of quitting her miserable life in London. The author has done an outstanding job of merging a significant historical incident and the unjust incarceration of sane people into the asylums for greed or other reason with Victorian romance. During British rule in India, something very tragic occurred in Cawnpore in '57 that affected many lives forever. The talent with which the author has included that part in the plot is praiseworthy. Mimi Matthews definitely knows how to present historical facts effectively and without sounding bookish. With carefully chosen words and formal conversations among the characters, this is a delightful treat for Jane Austen and historical fiction fans. Justin's gradual shift from bad-tempered to a kind man has made this an engaging read. Helena is more than just a damsel in distress. She makes plans to end her misery and does not waiver from them. Although she is seeking a kind man who will keep her safe, she is not entirely dependent on any man. All she needs is a little push from her loved ones and then she is ready to face her tormentor. The plot is filled with twists that kept me glued to the seat. 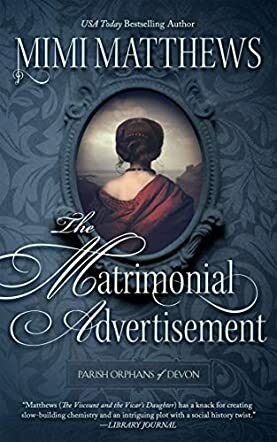 I enjoyed every second spent reading The Matrimonial Advertisement by Mimi Matthews.